I swooned a little when I saw the brand new My Minds Eye Miss Caroline collections. I forced myself to limit my purchase to two of the 6x6 paper pads. This one is called Howdy Doody. The papers in this pad are just so sweet and girly. The background paper on the card has that precious flower motif on the lower left. I added a Prima flower for texture. The little banner just makes me smile. It is a die from PaperTrey Ink. I cut off the top to make it flush and then attached the rounded part back onto the little banner so it looks like it is a pocket (maybe with a love letter in it). The stamps are all from a MFT Stamps collection called First Class Friend. And that little stick pin is part of the Miss Caroline collection too. 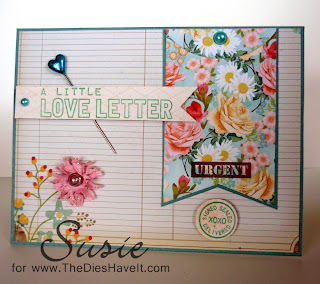 My inspiration for this card was this week's challenge at Hand Stamped Sentiments. The theme was Love is in the Air. I think this fits that bill. You can participate too, just head on over and check it out. I'll be back tomorrow with another fun card to show you. Love your card. That paper is so pretty! The added touch of the pearls and the stick pin gives it the wow factor. Thanks so much for playing with us this week at Hand Stamped Sentiments. This card is gorgeous! I love the bold colors and I bet this card feels so yummy with all of the different layers and elements. 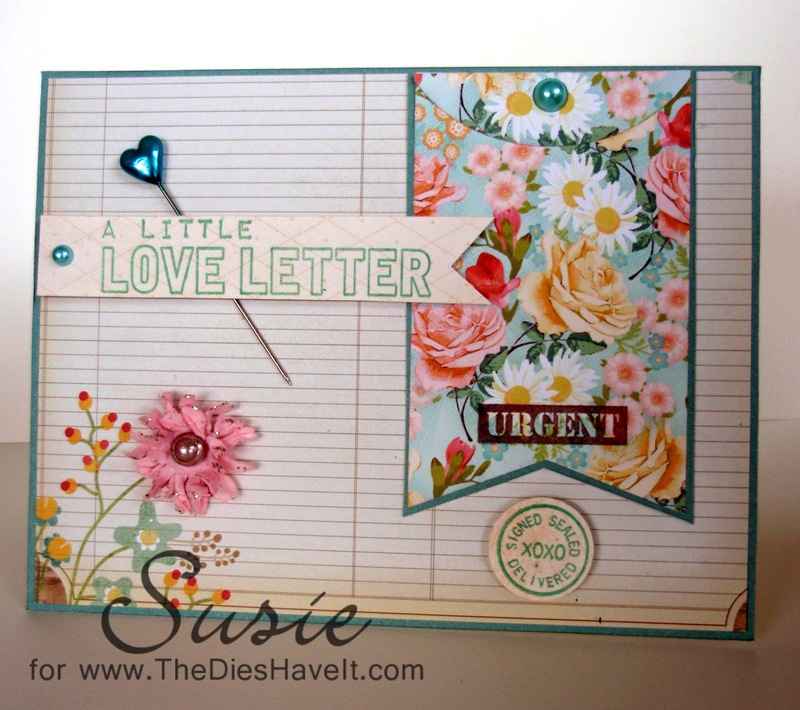 Thank you for joining us at Hand Stamped Sentiments. This is SO pretty! I love the floral DSP and the non-traditional colors! Swoon! Thanks for playing at HSS!